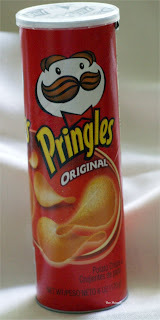 Incase you missed it yesterday, it was announced that the designer of the Pringles can passed away (R.I.P) in May. The interesting aspect was that a portion of his ashes were buried in a Pringles can. Honestly, I would have never even thought of anyone wanting to be buried in one but then again…. I don’t think I can ever look at a can of them the same way. Ashes burried in a pringle can ... kinda creepy. As an aside, I'm eating Rice Works Salsa Fresca as I make this comment. Yummmi! Thanks for calling that one.